"ePub" is the file format used by the majority of ebook publishers. The epub file is basically a miniature website, complete with meta information, that is compressed into a single file. There are several ways to create an epub file. The easiest way to create an epub file is to simply export it from your word processor. Unfortunately, like most easy things, they are also the lowest quality. Depending on the word processor you are using, the quality of the resulting ebook will vary and you also have very little control over the final ebook. Exporting does work for books with more simple layouts, and Scrivener has a better epub export than many other word processors. If you want more control over your epub file but still don't want to do it yourself, you can find someone to do it for you. It usually costs $50 to $100 and you simply send them your Word or Pages document, a cover image, and any additional instructions and they will produce an epub file for you. We have a cookbook we need converted for the Kindle. The book is about 170-200 pages long, needs a working table of contents, images optimized, and tables at the end of the book formatted. We can provide it in PDF, Pages, or Word format, whichever is easier for you to convert. We will also provide cover images if needed. We will want to make sure the book passes the Kindle specs and upload once they are completed. If you want total control over your epub file it is best just to do it yourself. As mentioned above, an epub file is just a collection of HTML and CSS documents, images, and some meta information. 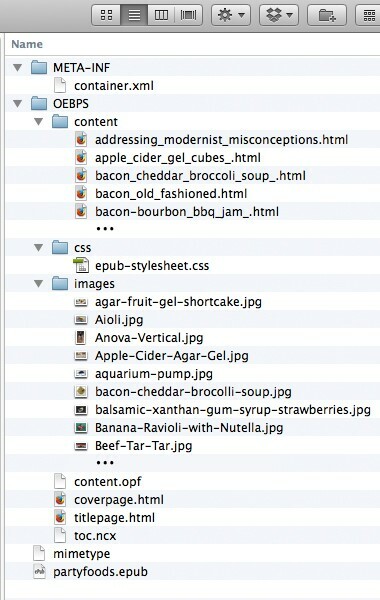 If you have a decent understanding of HTML it's a surprisingly easy process to create your own ePub file. If you go this route, we highly recommend purchasing The eBook Design and Development Guide. It's a fantastic resource that we used to created our first epub files, complete with examples of all the documents in an epub file and discussions of the nuances. It's only available as a Kindle book, but if you purchase it you can ask the author directly for a PDF copy as well. When I got started publishing ebooks, I wanted a little more control so I outsourced the creation of the epub file to Elance and for $50 I'd get back a customized file ready to submit to the ebook sites. Once I became more comfortable with the process I wanted to optimize my ebooks for the various e-readers so I looked into creating the epub files myself. While that was intimidating at first, an epub file is basically a miniature website. Since I'm very familiar with HTML I now just manually convert my book into html and put it into the epub format. This allows me total control over the look and feel of the book.